In selecting meat one must consider: (1) the taste of the family with regard to kind and cut; (2) the cost, being sure to note carefully the amount of waste, such as bone, rind, and rough fiber, or fat that cannot be used; (3) the fuel that will be required in cooking; (4) time and labor required for preparation. The number of individuals in a family influences one in the choice of cuts and the method of cooking. 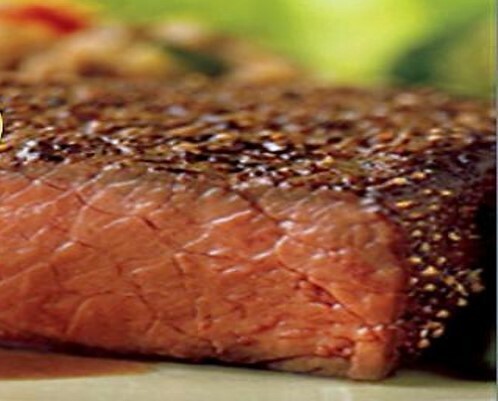 Steaks for broiling should be comparatively thick; therefore, if the family is small a sirloin steak is too large unless only half of it is cooked at a time. A large roast may be used if carefully reheated in various forms. In addition to the cut, there are certain standards of quality to be observed. The meat from fat animals is of higher food value and of better flavor than that from thin animals. If a cut of meat is excessively fat, there is, of course, a waste, but meat from a comparatively fat animal will be of the best quality. A cut from the round of the best beef is better than the choicest cuts of inferior animals. Good meat is odorless except for a certain fleshy smell, not tainted, strong, or musty. Meat must be dry on the surface – thick plump, and firm, but not hard to the touch or coarse in fiber; it should feel like velvet and should be easy to cut with a sharp knife. The bones of old animals are white and hard; of young ones, reddish and soft. Good meat should be well marbled with fat; roasts and chops from mature animals should have a layer of fat on the outside from one-fourth to one-half inch thick. Not much has changed when it comes to figuring out what meat to buy– except “(3) the fuel that will be required in cooking;” which I never think about. Ever. But meat on the bone is cheaper, pound for pound, and remains more succulent from having been cooked on the bone. I always find it almost impossible to tell whether meat on the bone or boneless meat is less expensive. I have to make all sorts of assumptions about what percentage of the meat is bone. . . and then there’s the math. . . .all of which I’m trying to do on the fly while standing at the meat counter. I just want you to know I’m still enjoying your posts, but super busy right now with planned move and related downsizing, plus other things pending. Thanks for letting me know. I appreciate all your wonderful support across the years. I hope that your move goes smoothly . . . and I’ll look forward to an update once things settle down. It is really good to know how to buy a good piece of meat. It is something my mom knew instinctively and something I have learned, sometimes from my husband who cooked and went to cooking school his first military enlistment. I have been interested in working more with Skirt steaks. I’m not good at instinctively knowing which meats are the best . . . and have had my share of tough, not very tasty meats across the years; but like you I’m learning. It sounds like fun to experiment with making skirt steaks. I still laugh when I remember what buying beef in our Liberian market was like. They’d walk the cattle down from Guinea, which meant they were tough and skinny to start with. Then, after they were butchered, they’d be divided into something resembling traditional quarters, and hung. When you went to buy your beef, you’d say, “Give me a piece [this big] — holding your hands in about the size you wanted. The seller would grab a knife, or more often a machete, and hack off a piece. That’s what you took home, and put in your pressure cooker. It was an experience, believe me. Now and then I could identify a traditional cut embedded in the hunk, but given the circumstances, even the tenderloin wasn’t tender! What a fun story! You described the cattle and the market so vividly -and I feel like I can really picture it. It sounds like a wonderful adventure. Great read, makes me hungry for a good roast right now! I love roasts – and all the left-overs, which I can use to make other dishes. I could have used those suggestions when we ate meat. Although we do occasionally have beef, we tend to eat more chicken and fish now. Being good makes one long for a good, juicy steak. It’s good to see that fat is part of good meat. A little fat really does improve the flavour and texture of beef. I agree- though very lean meat seems to be favored by many.